He was a very rich and important man from Cheshire. John Savage, Viscount of Colchester and Earl Rivers, was a Cheshire MP from a Catholic family. He and his family owned land in Ireland and England. Oxford educated, he followed into politics and became a Member of Parliament. The Savage family were lords of the manor of Frodsham. His Coat of Arms, argent, six Lions rampant, sable, 3.2. and 1. Savage. The crest of the family was the bear’s paw. Earl Rivers, the Steward of Halton, lived at Halton Castle, near Runcorn. With numerous other property’s including the Manor of Tarvin, Earl Rivers Family home was the great manor house at Clifton near Runcorn, called Rocksavage which was passed down through his family. Rocksavage was very similar in appearance to Brereton Hall, which was built about the same time. From 1632 he was M.P for Cheshire and was advanced to the House of Lords in 1640 after the granting of his title. 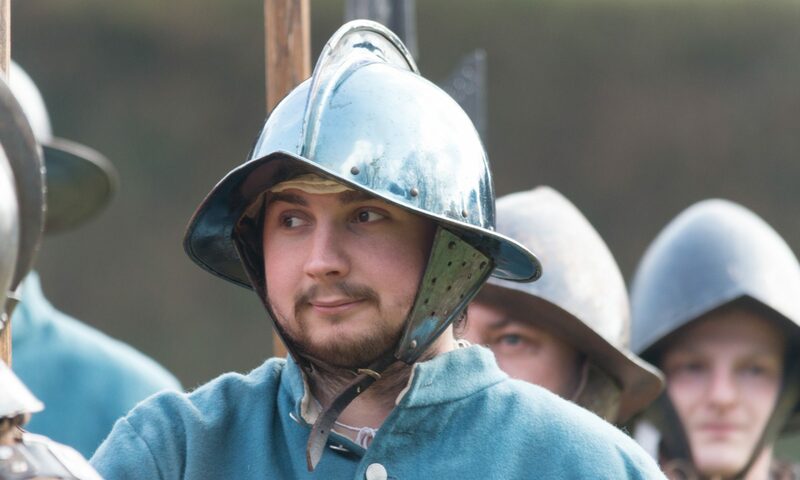 In 1639/40 Earl rivers was appointed onto a committee investigating complaints against Charles 1, during 1641 his allegiance swung back to Charles and in 1642 he was given the Kings’ commission of Array to raise a regiment of foot in Cheshire. Savage raised most of his troops in Cheshire and some in Kent, a small Regiment numbering around 350 men, but well equipped. Before the Civil War some of it soldiers had seen service in Europe and Ireland, so it was well trained and with experienced Officers. Earl Rivers was there the day the King raised his standard in Nottingham and his Regiment served in almost all Major Battles there and after. In early 1644 King Charles 1st summoned a Parliament at Oxford (also known as the King’s Oxford Parliament) to which Earl Rivers was called and this appears to have curtailed his military career. John Savage was in Bristol with Prince Rupert at its surrender in September 1645 and petitioned the Committee for Compounding on 11th October 1645 that he had submitted upon the articles of the surrender of’ Bristol and prays to be admitted to compose for his delinquency. In 1646 a “Council of War” was held in Warrington where it was decided that the defences of the Holton castle were to be dismantled. In time this was achieved and Halton castle was to have no further military function. All the possessions at the castle belonging to the Earl were stripped and sold. He was assessed by the Committee for the Advance of Money at £5000 on 17th November 1645. In 1648 he was committed to the New Bridewell prison for raising arms against Parliament, having surrendered Halton Castle, Co. Cheshire in that abortive rebellion. Subsequently released, he was summoned on 17th November 1649 to give satisfaction to his assessment and on 21st November 1649 he was discharged the debt upon proof that he had paid and secured his fine at Goldsmiths Hall. When Earl Rivers returned to Cheshire with Rocksavage being ransacked and uninhabitable and Holton Castle dismantled Earl Rivers retired to the castle at Frodsham castle where he was stripped of the family honours and estates and this is where he died on 10th October 1654. A few hours after his death with his body lying within the castle the Castle was set on fire and burned down it was completely destroyed. No doubt this fire was intended as the Earl’s funeral pyre, it was only with great difficulty that the body was rescued, later to be buried privately two days later unostentatiously at Macclesfield.